A: Wellsprings is a UK company based on the island of Guernsey that has been providing natural progesterone cream since 1997. From humble beginnings we now have thousands of customers, some that have been using our cream for many years. Throughout that time we’ve remained true to our original goal of producing the highest quality, most effective natural progesterone cream available and ensuring our customers get their orders on time, with the minimum of fuss. Q: Is Wellsprings Serenity exactly the same product as Serenity for Women? 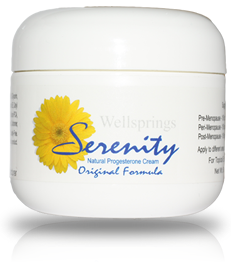 A: Wellsprings Serenity is a premium natural progesterone product. While its formula is not identical to Serenity for Women - produced by Health & Science - the natural progesterone content is similar and customers should expect the product to be just as effective at symptom relief. Q: Is Wellsprings Serenity the same price? Q: Is Wellsprings Serenity paraben free? A: Yes, as are all Wellsprings products. Q: I placed an order before 30th August 2012. Who will be sending it to me? A: Health & Science will fulfil your order. Q: How can I get in contact with Health & Science?